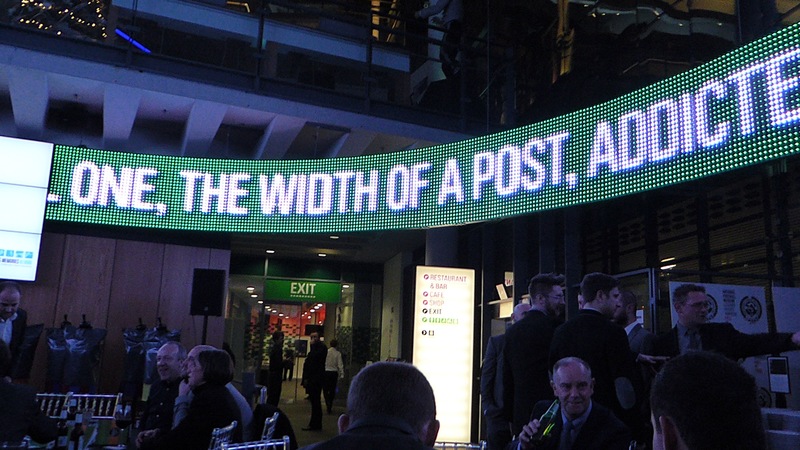 On Thursday evening, Width of a Post writing team members Jason McKeown, Katie Whyatt, Damien Wilkinson and Mahesh Johal attended the third annual Football Blogging Awards event, held at the superb National Football Museum in Manchester. 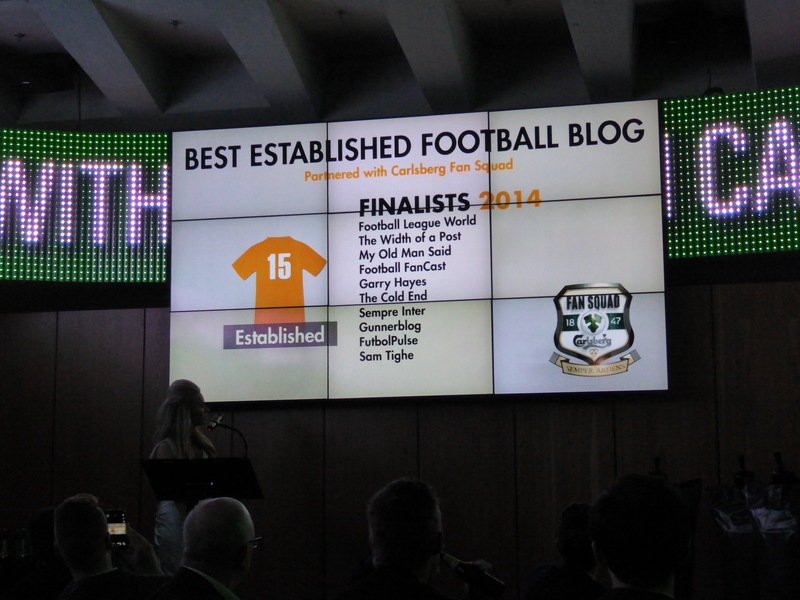 Width of a Post was once again shortlisted for two awards – Best Established Blog and Best Club Blog – whilst Katie’s brilliance was deservedly recognised by being shortlisted for Best Female Blog, covering both her work for WOAP and her own Bantams Blogger site. Sadly there was no repeat of 2013’s victory and we went home empty-handed, but it was still a wonderful experience and a night to feel proud. The shortlists were originally put together on the back of public votes, and to have our readers enjoy what we do enough to have taken the time to vote is both humbling and a verification of what we do. 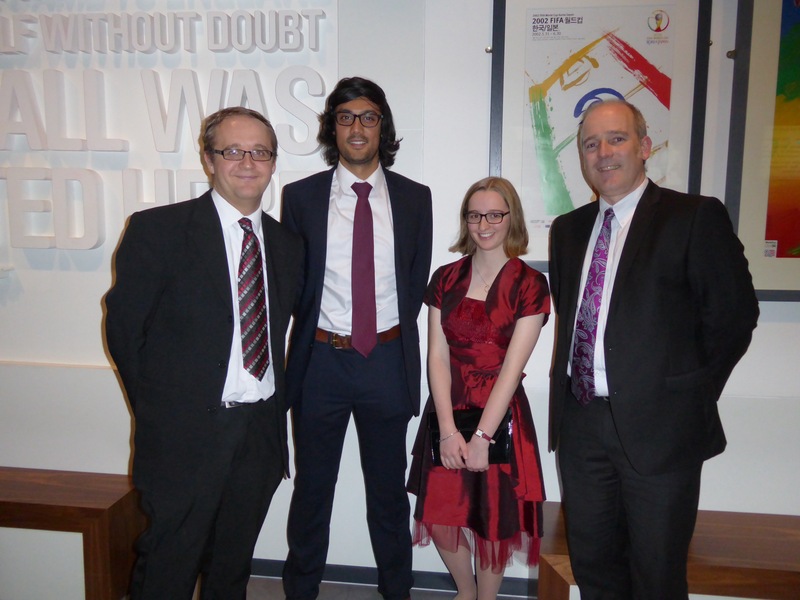 There were two winners per category on the night – another public vote, and also a panel of esteemed judges who reviewed each site. It would have been fantastic to have triumphed in one of the three categories, but we were amongst some illustrious company; and to be ranked amongst the best blogs in the country is still something to take pride in. Every couple of months, I am usually approached for advice by someone starting or looking to establish a blog, and I always include one pointer in my response: it can be a lonely experience. Unless you are doing it for financial gain, making it work is all about having a passion and love for what you do. There are times it gets you down, such as when you spend several hours writing an article only to see it torn to pieces in minutes. For the first four months of WOAP’s existence, we averaged 200 visits a day and it almost felt like there was no point. You do it because you enjoy doing it, and then it becomes a bonus if and when other people want to read it too. The WOAP audience has grown significantly since those early days, and we now typically attract between 1,300 and 2,500 visits per day (sometimes even more). 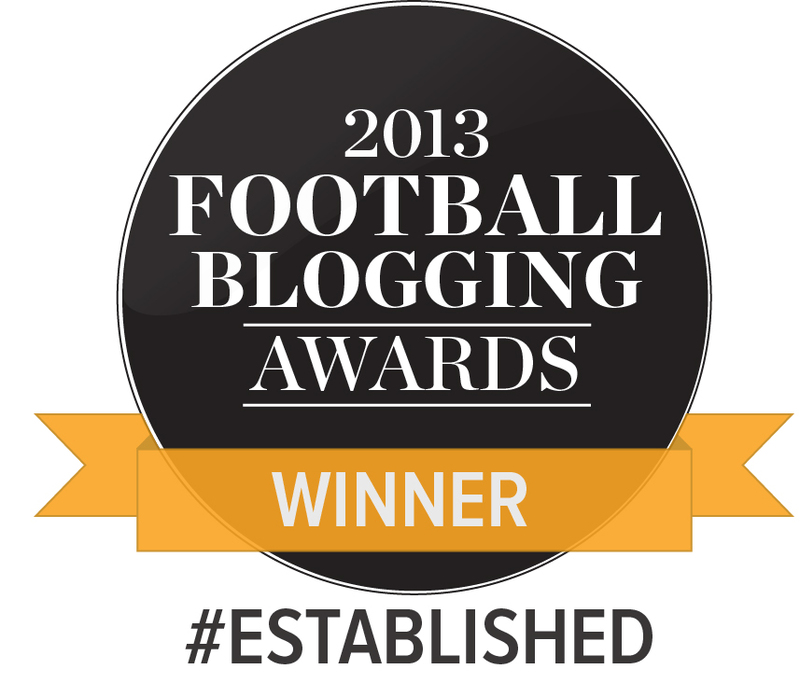 I’m proud of the site’s achievements along the way, such as covering every step of the epic 2012/13 campaign, interviewing key people at the club and winning the Best Established Blog award last year. Giving a platform to other writers is also something I take great delight in, and I hope others members of the writing team won’t mind me singling out Alex Scott and Katie Whyatt. Katie in particular is destined to have a career as a professional writer, and one day I hope that it’s my claim to fame that I can say I played a small part in helping her becoming renowned for her talents. I’m also chuffed that, since missing out on reporting on a January 2012 3-0 loss to Rotherham, WOAP has since covered every single Bradford City match. Home, away, league, cup – even every friendly. That’s 176 games in a row and counting. You don’t go looking for compliments, but it’s a nice feeling when you get them. I’m proud of the fact hundreds of people appear to like what we do. I’m glad there is relevance to our efforts. But it is a big effort, one that consumes so much time. When you regularly give up your Saturday evening to do a match report, or forgo a Sunday lie-in to crack on with writing up an interview, you occasionally question your sanity. Even proofing and uploading other people’s work takes up a lot of time. I miss the old days of having a writing partner in Michael Wood, and the great work that we did together, although nothing lasts forever and being a sole editor is a fantastic experience. This December, WOAP will be three years old. I’ll be honest, it feels a lot longer. We are quite prolific in terms of how many articles we publish every week, and I think this will be the final season that this is the case. Family and all that, plus there comes a time of other priorities. I won’t be giving up the site, because I enjoy writing too much. But there will come a time when it is right for me to take more of a backseat and devote more time to others – even to other writing projects. Perhaps I’ll even get around to that long list of household chores! Nights like Thursday are special though. It was special to be at an event made up of arguably the country’s best amateur football writers and broadcasters. It was special to be invited to an event because your readers voted for you to be there. Thank you to everyone who voted for us. Thank you to everyone who reads the site. We care deeply this wonderful football club. We feel proud of our little corner in the Bradford City community. And we are grateful that you choose to make us a small part of your world. We’ll miss you Jason when you take your well deserved back seat. Quite how you find the time to do as much as you do I don’t know! Every week I feel lucky that we’ve got you guys covering the ins and outs of Bradford City. Just so you know… just generally in any discussions I have with my mates who follow City its never, “Did you see the report in the paper?”, or “Did you hear what they said about the game on the radio” – Its, “Did you see that Width of a post said we played pretty well” etc etc. For those of us exiles who don’t get to go to as many games as we’d like, you guys have become the barometer for how we judge City’s progress every week. For that you can be proud. Thanks for your constant efforts. Thank you for all the hard work you all put into keeping me (and lots of others) informed and entertained. It is truly appreciated.